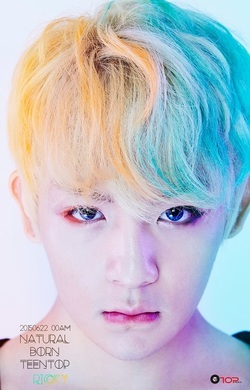 TEEN TOP. They are under T.O.P Media (South Korea) and Universal D (Japan). -For his audition he sang SHINee's "Replay" and danced to Black Eyed Peas' "Boom Boom Pow"
2011: "Supa Luv", "No More Perfume On You"
2012: "Going Crazy", "To You", "Be Ma Girl"
2013: "I Wanna Love", "Miss Right", "Walk By...", "Rocking (No Joke)", "Date"
2014: "Missing", "I'm Sorry", "Snow Kiss"